The Class of 2012 at New Trier High School lived up to the school’s impressive record on the ACT exam. More than one-half of students achieved scores that would place them in the top nine percent of students nationally, according to an analysis presented to the Board of Education Monday. More than four out of five would land in the top 26 percent among peers across the nation. But new ways of slicing the data turned up some head-turning findings that Superintendent Linda Yonke characterized as “just incredible”. Across the achievement spectrum, New Trier students made greater strides than would ordinarily be predicted based on their scores on an ACT-aligned test taken earlier in high school. According to New Trier’s analysis, 56 percent of New Trier students pulled composite ACT scores that were higher than the range predicted by their achievement on the PLAN test, which is taken in October of sophomore year. Ordinarily, three-fourths of students are expected to fall within the predicted range, with the remainder split equally among students who test higher and those who test lower. “On average, 56 percent of our students are exceeding the projected range in ACT scores, when nationally it is 12.5 percent,” said Yonke. “It is just incredible. I don’t think we can emphasize that enough.” Only one percent of students earned an ACT score that fell below the predicted range. Paul Sally, assistant superintendent of curriculum and instruction, said the analysis points to the depth of student achievement at all levels. “When you look at the fact that 83 percent of the class is in the top 26 percent of the country, that is quite an astounding statistic,” said Sally. “That presents its own challenges, in terms of making sure that kids feel like they are successful and are achieving in the midst of a high-achieving community.” The average composite score was 27.4. While many suburban high schools are working to enroll a broader range of students in Advanced Placement courses, New Trier High School is working to convince parents and students that Advanced Placement courses aren’t a singular avenue to college success. Sally noted the ACT averages are ‘incredibly high” for students who finished their English and math sequences without taking an Advanced Placement course. Among Level 2 English students, the average ACT English score was 21.2, more than three points above ACT’s college readiness benchmark of 18. Similar results were found in math. 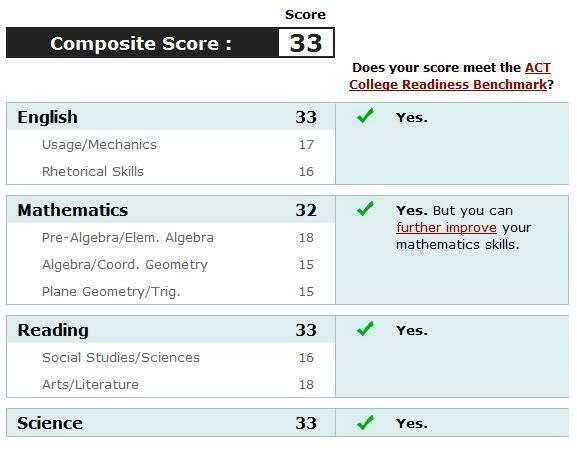 Students whose highest math course was 2 Level pre-calculus posted an average score of 23.5, more than a full point above the college-readiness benchmark of 22. “This speaks to the rigor of the curriculum, up and down,” said Sally. ACT has correlated high school ACT scores and college freshmen grades to come up with “college readiness benchmarks”, or scores that suggest a student has a 75 percent chance of earning at least a C, and a 50 percent chance of earning at least a B, in a related college course. The school’s analysis found that students in the Class of 2012 sat for slightly more ACT exams, an average of 2.8 exams per student. Nearly two-thirds of students took the test before ACT was given as part of the state’s Prairie State Achievement Exam in April of the junior year. “Not everybody is taking the ACT five times,” said Sally, noting that 75 percent of students take the test three or fewer times. Sally said that while it’s safe to say that taking the ACT a second time is helpful, the data is inconclusive about whether scores improve significantly as a result of sitting for the exam multiple times. Students who take a high number of ACT exams start early, so some improvement would naturally occur as a result of the additional time spent in relevant courses. Peter Fischer noted there is a perception that affluent students have the resources to boost their scores on the college admissions exams. “A lot of people outside the school district will look at (these scores) and say, Of course, because all the students in that district can afford to get the tutors and take the (ACT preparation) classes,” said Fischer. He noted that students approaching their junior year are bombarded with solicitations for products and services to improve their college-admissions’ test scores. “How do we respond to the claim that our numbers are skewed by the fact that our students are doing things outside the school day?,” he asked.